The rent at Lofts at Eden Apartments ranges from $1,140 for a one bedroom to a $1,350 two bedroom. Apartments in this building are about 10% more expensive than the Sanford average. This is a pet-friendly apartment. Lofts at Eden Apartments has a Walk Score of 30 out of 100. This location is a Car-Dependent neighborhood so most errands require a car. 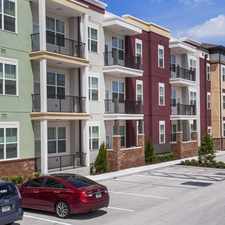 Experience apartment living at its finest in the beautiful area right outside of Orlando. At the Lofts at Eden, you'll find the perfect blend of comfort, convenience, and class, all housed in our energetic and exciting location. Perfect for all lifestyles and personalities, our location provides our residents with the best options for dining, shopping, and entertainment right outside their doors. Residents of the Lofts at Eden enjoy the finest in-home and community amenities, all meticulously designed to exude a sleek, contemporary feel throughout the community. Each apartment boasts articulate finishes and open layouts enhancing the living experience for all residents. We gave all the attention to detail, so you can just enjoy living at your new home. Lofts at Eden becomes the gateway to exploration. With easy access to I-4 and Highway 417, the entire greater Orlando area opens up to you. Explore the nearby Central Florida Zoo or Botanical Gardens, swing on over to Disney or Universal for a fun Saturday or day off. Fashionistas will love the great shopping nearby at Market Place at Seminole Towne Center. Residents can also find some beautiful scenery with the close proximity of the St. Johns River and Lake Monroe. From close easy access to Orlando to the many lakes and rivers nearby, it's easy to find your own niche. As a special convenience to our residents, our community is pet-friendly. Each of our in-home features was carefully selected with residents in mind. Utilize all the space afforded you to make your new apartment your home. Ample closet and storage space go hand-in-hand with our open layouts ensuring you have room for everything you need in your life. Channel your inner chef in our fully equipped kitchens, or take some time after a long day to sit back, relax, and enjoy the simple delicacies of apartment living designed specifically for you. You'll love your new home from the moment you see it. Browse our site here for more information, and call us today to begin the application process! Explore how far you can travel by car, bus, bike and foot from Lofts at Eden Apartments. Lofts at Eden Apartments has minimal transit which means it is possible to get on a bus. Lofts at Eden Apartments is in the city of Sanford, FL. Sanford has an average Walk Score of 29 and has 53,570 residents.